Breast Thermography is a digital, infrared photograph of your breast. Thermograms can increase your chances of detecting early stages of breast cancer by several years when combined with breast self-examination, doctor examination and diagnostic Ultrasound. Most patients are surprised how easy, quick and pain free the procedure is and they choose to make annual Thermograms a key part of their selfcare health maintenance program. Advantages of Breast Thermography at a glance. • Thermography is safe for people with implants and for pregnant women. • Thermography is safe for women with fibroids and dense breasts. 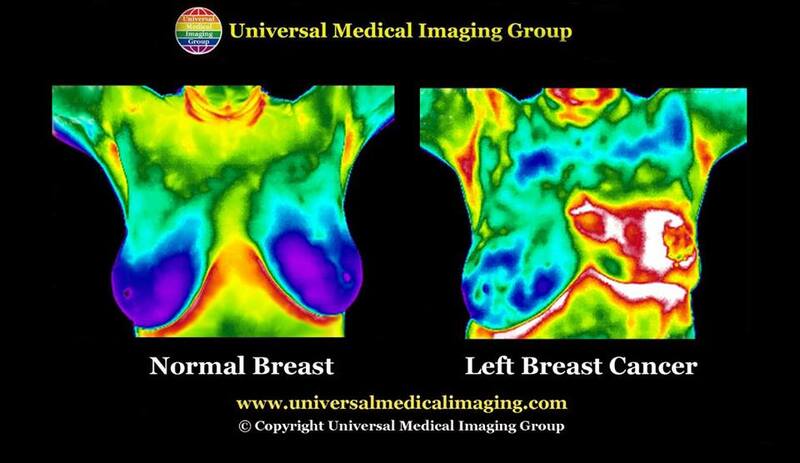 • Breast Thermography has been FDA approved since 1982 as an adjunct to other anatomical scans. Who should have Breast Thermography? Women and men can benefit from Breast Thermography screening. Younger women in their 30’s and 40’s with a family member with breast cancer are particularly benefited by Breast Thermography. In a private room you will disrobe from the waist up and after a 15 minute acclimation time, 6 pictures will be taken of your breasts. This takes another 5 to 10 minutes. The images will then be interpreted by a doctor and the report will be sent to you. Breast Thermography can provide information on breast health, risk assessment, breast cancer, early detection, prevention and ultimately the preservation of the breast and the survival of women. Thermography utilizes highly sensitive infrared cameras that can display abnormal cellular and vascular patterns in breast tissue. Universal Medical Imaging Group and PH Miracle strive to provide accessible thermal imaging that can detect subtle physiologic changes that accompany breast pathology, whether it is cancer, fibrocystic disease, and infection, or vascular disease. Breast Thermography is beneficial for women of all ages, but especially for women who do not want exposure to radiation, have implants, have dense breast tissue, are fibrocystic, have had a mastectomy or are unable to undergo routine mammography. Current research has determined that the key to breast cancer survival rests upon its earliest possible detection. If discovered in its earliest stages, 95% cure rates are possible. Our center is dedicated to providing one of the most important adjunctive breast imaging procedures available.